Jīvaka Kumar Bhacca is known as the Father-Doctor of Thai Medicine, and thus Thai Massage. He was the physician and on-call doctor to the Gautama Buddha when needed. Not to mention, much of what we know about Dr. Jīvaka comes through many beautiful and potent stories within the Buddhist Scriptures. In fact, there is even one sutra named after a teaching that Lord Buddha gave to Jīvaka. It is called 'The Jīvaka Sutra'. He is a legend in the Buddhist Medicine world. The image to the left is taken from a book entitled Sutra of the Medicine Buddha: With an Introduction, Comments, and Prayers. I think it beautifully describes the relationship that Jīvaka had with Gautama Buddha as both a student and caretaker. It brings up point that I would imagine Jīvaka to hold close to heart. The greatest contributor to what we know of Buddhist Medicine is not Jīvaka Kumar Bhacca. It is the Medicine Buddha Bhaiṣajyaguru, along with the current epoch Buddha, Gautama Buddha. Dr. Jīvaka was a student of Gautama Buddha. Although Dr. Jīvaka is held to be the "Father-Doctor", in his mind it is really the BuddhaDharma taught by all Buddhas that is the highest medicine. It was because of his aspirations and his previous training under great masters of the time that Jīvaka became a doctor of ancient Indian medicine. He was thus able to qualify to meet the Gautama Buddha, as well as the other great beings that taught Jīvaka after his meeting Gautama Buddha, and bestow the knowledge upon him to help ease the ailments and discomforts of Lord Buddha and the Sangha. As stated in this image to the left, Jīvaka expanded and developed his already existing knowledge of medicine while under the tutelage of Gautama Buddha and took corporeal medicine to new heights. He was at the forefront of his field at the time. My great respects and appreciation for Dr. Jīvaka's efforts, skill, and passing the lineage on to others who then passed it all the way down to the present day. 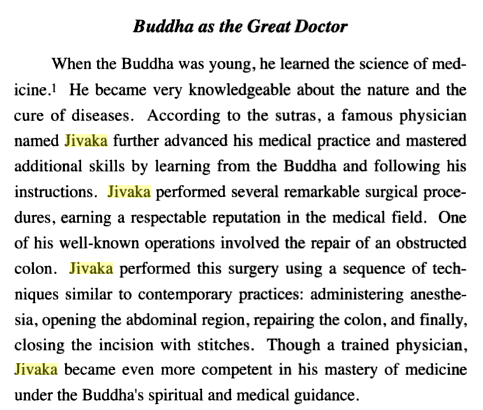 Jivaka was the most celebrated doctor in India during the Buddha's time. Immediately after his birth, Jivaka was placed in a wooden box and thrown away by his mother, a courtesan, on a rubbish heap beside the road. The same morning baby Jivaka was abandoned, Prince Abhaya, a son of King Bimbisara, happened to pass by the rubbish dump on his way to the palace. When the prince discovered that the baby was still alive, he was moved by compassion and ordered it to be brought up as his adopted son. When he grew up, Jivaka studied medicine for seven years under a famous teacher. Soon his unusual skill as a physician and a surgeon became known. He was called upon to treat kings and princes, including King Bimbisara himself. But of all the distinguished people Jivaka attended to, his greatest pleasure was to attend to the Buddha, which he did three times a day. Jivaka helped in many ways. When Devadatta threw down a rock splinter and injured the Buddha's foot, it was Jivaka who healed him. Realising the advantages of having a monastery close to his house, Jivaka built one in his mango garden. He invited the Buddha and his disciples to the monastery, offered alms and donated the monastery to the Buddha and the monks. After the blessing ceremony of this monastery, Jivaka attained the first stage of sainthood (sotapanna). Later, when King Ajatasattu asked him where he could go for religious discussions, Jivaka brought him to see the Buddha. Although the king had killed his father under the evil advice of Devadatta, King Ajatasattu became a distinguished lay follower of the Buddha and supported the First Buddhist Council after the Buddha's death. This next bit of information was composed by the vastly studied and experienced scholar, Dr. Pierce Salguero. His work is cited by so many - many times overly cited and without permission - and his books on Thai Massage and Medicine are internationally acclaimed. His mind and teaching skills are praised, especially his classes on religious and asian studies. That's the good word about him, though I've only met him outside the academic setting. As far as I think scholars go, he's a fun and interesting dude to be around for sure. Definitely a guy to take out for a beer, or tea - whatever he takes. Be sure to go to the full article on Pierce's own website, click here. Jīvaka — called the “Father Doctor” by many healers in Chiang Mai, and the "King of Physicians" in Mahayana Buddhist traditions — is a vibrant example of a crossculturally transmitted Buddhist medical symbol. Tradition holds that Jīvaka was the personal physician of the Buddha, and a biography of Jīvaka is found within the Buddhist scriptures in multiple languages. It is said that Jīvaka was an orphan who was raised by Prince Abhāya. When he came of age, he studied medicine with a well-known master in northwestern India, apprenticing with this teacher for a period many years before returning back home. Different versions of the biography relate up to a dozen cases where Jīvaka healed different individuals, including instances of major surgeries like the opening of the abdominal and cranial cavities. Among Jīvaka's patients were merchants and their wives, kings, and in some versions even the Buddha himself, who came to him for a purgative of powdered lotus flowers. In the Theravada Buddhist canon, the biography of Jīvaka is found in the eighth Khandhaka of the Mahāvagga section of the Pāli Vinaya, the monastic "basket of discipline" composed from the fourth to the first century BC. In addition, other Theravada scriptures mention Jīvaka as the donor of a mango grove called Jīvakarama, which he donated for the use of the Buddha's order of monks as a retreat for the rainy season. He also on occasion is mentioned as a listener of the Buddha's preaching, including in one text named for him, the Jīvaka Sutta. In contemporary practice, Jīvaka is the "patron saint" of traditional Thai healers, and is widely propitiated for assistance in healing client's ailments. Jīvaka is viewed as a powerful spirit ally in the indigenous Thai cosmology, whose presence can be invoked by a healer in order to dispel disease. Many Thai practitioners believe that Jīvaka discovered traditional Thai herbal medicine, therapeutic massage, and other healing practices himself, and treat him as the progenitor of their lineage. Stories abound in the oral tradition about Jīvaka's teachings and travels in Thailand, although these are clearly apocryphal. By the late first millennium C.E., Jīvaka was being worshipped at Dunhuang and Turfan along the Silk Road. A medical text attributed to him (the Jīvakapustaka) written in Sanskrit and Kohtanese discovered in this region demonstrates his importance to medieval medicine in India and Central Asia as well. Jīvaka also appears in Tibetan Buddhist texts, where he is said to have been an expert in trephination (the surgical opening of the skull) for the extraction of parasites. He is considered an important patriarch of the Tibetan medical tradition, for example being depicted in the Medicine Buddha mandala from the Blue Beryl commentary along with other important medical figures from Buddhist and Ayurvedic tradition. 1. Chen Ming 陳明. 2001. “Yindu gudai yidian zhong de Qipo fang 印度古代醫典中的耆婆方.” Chinese Journal of Medical History 31(4): 202-06. 2. ———. 2005b. Dunhuang chutu huhua ‘Qipo shu’ yanjiu 敦煌出土胡語醫典《耆婆書》研究 (English title: A Study on Sanskrit Text of Jīvaka-Pustaka from Dunhuang). Hong Kong: Xinwen feng chuban 新文豊出版. 1. Emmerick, R.E. 1979. “Contributions to the Study of the Jivaka-Pustaka.” Bulletin of the School of Oriental and African Studies 42(2): 235-43. 2. Li Qinpu 李勤璞. 1997. 《耆婆五藏论》妊娠学说的源流 ”’Qipo wuzang lun’ renshen xueshuo de yuanliu” Chinese Journal of Medical History 27(3): 170-75. 3. Liu Mingshu 刘铭恕. 1996. “Bian Que yu yindu gudai mingyi Qipo 扁鹊与印度古代名医耆婆.” Zhengzhou daxue xuebao 郑州大学学报 5: 100-01. 4. Salguero, C. Pierce. 2009. “The Buddhist Medicine King in Literary Context: Reconsidering an Early Example of Indian Influence on Chinese Medicine and Surgery.” History of Religions 48(3): 183-210. 5. Zysk, Kenneth G. 1982. “Studies in Traditional Indian Medicine in the Pāli Canon: Jīvaka and Āyurveda.” Journal of the International Association of Buddhist Studies 5(1): 70-86. 6. ———. 2000 . Asceticism and Healing in Ancient India: Medicine in the Buddhist Monastery. Delhi: Motilal Banarsidass. Throughout the following part of this page, I will be adding a bunch of different variations of the typical chant used in a Wai Khru for Dr. Jīvaka Kumar Bacca. Why am I adding so many? And the grammar, sentence structure seems to contradict each other. Exactly. This is the elephant in the room. Let's address it. There are many versions. If you would like to properly - traditionally - pronounce and understand the chants, it is best for you to go learn the Pali - and Sanskrit - language for yourself. These translations varying widely and terribly. I tend to stick with the one that I have marked as traditional, as I personally know the person who translated it and know they understand Pali. Many of the translations can be explained and found in a well compiled book by Bob Haddad entitled Thai Massage and Thai Healing Arts: Practice, Culture, and Spirituality. It was released in 2013. What I like about this book, is that it isn't just Bob talking. He was aware and self-less enough to ask various practitioners of the different fields and aspects of Thai Medicine and Arts to write articles on their expertise and experiences. Good show, Bob! Check it out, and order it if you haven't already. For reference, a Wai Khru before practice and treatments would always begin by offering homage and respect to the Triple Gem, and particularly to the Lord Buddha as the King Doctor of Medicine, and teacher of Dr. Jīvaka. I lower myself [bow down] in homage to Him, the Worthy Lord, the Pure One [without mental defilements], the Fully Self-Enlightened One ["Correct and Full Buddha" as a result of His own efforts and not by grace]. Om, I pay homage [with my head] to Jivaka. Who out of compassion for all sentient beings has brought to us divine medicine. I hereby declare my respect to the great pandit, the intelligent and wise one. May I be happy and free of illness. The following is the homage to Jīvaka used at Wat Po Traditional Medical School. I transliterated it for optimal pronunciation from Thai to English. Note this is Thai pronunciation of Pali to English, which many scholars and professionals discount as correct and traditional. It is then followed by another chant for protection, guidance, and healing within the Triple Gem (Thai style) yet more towards the realm to incantation and invocation. That is then followed by a poetic translation into Thai. It combines the "5 Epoch Buddha" mantra of "Na Moe Poot Ta Yaa" (Na Mo Bud Dha Ya) with a poetic verse for healing and protection. Followed by a Pali / Thai idiom phrase with a rough translation as: "May all illness, disease, badness be gone and go away to never return!" This is then finished with a verse / incantation asking the Triple Gem (Buddha Dharma Sangha) to protect and watch over the masseur while massaging so that no 'bad juju' or dis-ease and holdings that are removed during the session then travel and get stuck to them instead. Something like a force-field and guardian mantra. Common Modern Day "Northern Style"
This is probably the most wide-spread version of the Jīvaka Chant. It is accredited to the Northern Style system of Thai Massage. Again, there is debate in that title / label. Please see the article by Tevijjo Yogi on the Thai Massage page. "We invite the spirit of our Founder, the Father Doctor Shivago, who comes to us though his saintly life. Please bring to us the knowledge of all nature, that this prayer will show us the true medicine of the universe. In the name of this mantra, we respect your help and pray that through our bodies you will bring wholeness and health to the body of the one whom we touch." He who is beloved by deities and humans, beloved by Brahma, I pay homage. Is not translated and is particularly the part associated with magick and incantation. "The Goddess of healing dwells in the heavens high, while mankind stays in the world below. In the name of the Founder, may the heavens be reflected in the earth below so that this healing medicine may encircle the world." "We pray for the one whom we touch, that s/he will be happy and that any illness will be released from her/him." The traditional ไหว้ครู ceremony practiced in Thailand is an integral part of Thai culture, no matter what professional one has. It is a defining aspect to 'Thai-ness', and a pivotal stepping stone for any practitioner. Thai massage is a prime example of this, along with มวยไทย Muay Thai. Most people would be more familiar with the traditional dance Muay Thai fighters perform in homage to their lineage and teachers before they fight, while wearing a thick colored head-band known as a มงคล 'mongkhon'. The following link to the book " Seven Peppercorns" was written by a Thai Masseur named Nephyr Jacobsen. She runs The Naga Center in Portland Oregon and has spent a good deal of time in Thailand and has studied with a multitude of real Thai Doctors. It is an interesting book and worth the read. Enjoy! The following is taken from and fully accredited to the book Thai Massage and Thai Healing Arts: Practice, Culture, and Spirituality compiled by Bob Haddad. Komarabhacco / Kumarabhacco - one who is raised by a prince or one who practices pediatrics. means one who has control of the 5 senses. Proma – Brahma – the Creator in Hindu mythology. The word Proma comes from the Thai pronunciation of the Sanskrit word Brahma. In Buddhism,Brahma is not the creator. He manifested at the same time as our world system arose. Reusi – ascetics, hermits. It is the same as the Sanskrit word rishi which means learned/wise person. Sirasa – Often this will be written as "silasa" instead of "sirasa." In the Thai language the "r" is sometimes pronounced as an "l" sound. of the line would change accordingly. The correct meaning here is "head" coming from the word sirasa. Thank you for this, guys! Rejoicing in your good work!! !